The sky was relentless in her anger. She waged a vicious war against the sea below, cursing every drop of ocean tide as her lesser, driving the depths to churn and spew back a hostile defense. Though the coast was not far, we would never make it. The waves pounded with merciless rage against the hull of the ship, a whisky vessel. Each wave measured her strength and found her lacking. The main mast had snapped with ease as the sky reached down to assault the sea and flicked the mainsail aside in annoyance. It traveled her evil breeze, high in misty clouds of vengeance, being carried to the nearing shore. The mortals aboard feared an almost certain and impending death if they continued the struggle toward safe harbor in the midst of such cross firing warfare. Heeding my captain’s order, I and all the men filed swiftly below to the cargo. But there below deck, I met with a thought more troubling than that of the villainous sky above us or even death itself: dumping perfectly good whisky to save our own lives. Seemed somewhat wasteful. I would need quick wits and swift action. The men charged the stock. I reached for the brig sword and took up a stance between the helpless cargo and her panicked violators. As the ship tossed and rolled, as the water rushed in through the damaged planks, I called for sensibility. I dropped the sword and began my search. 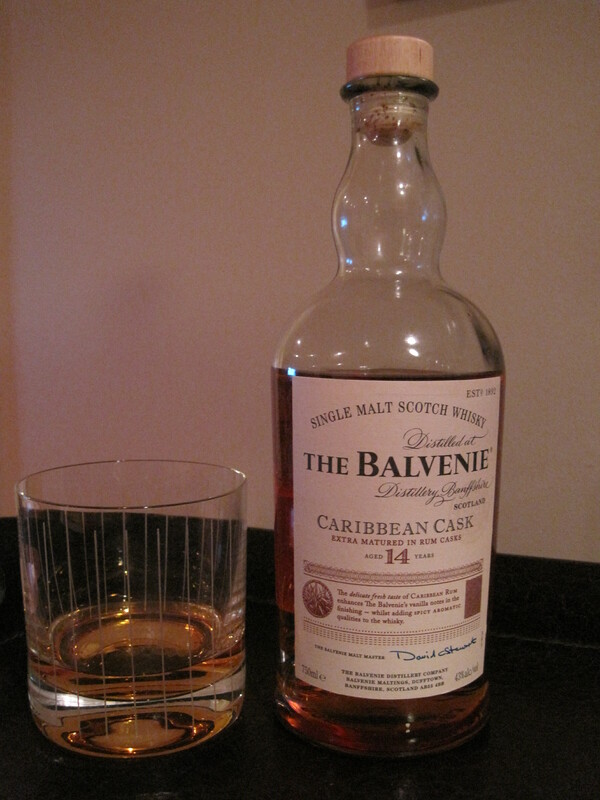 I looked for a malt that I was yet to have savored and found only one: The Balvenie, Caribbean Cask, 14 Years Old. Apologizing to the beauty, I pulled my knife from my trousers and pried the tap loose enough to let a bit flow and then recapped it with the metalsmith’s hammer. As the men made their selections, each helped another carry his barrel to the topside. One by one they lifted them into the blackened sea and then jumped in to follow. I was the last. Having already rammed my knife into the side of the barrel, I turned it in the water so that it was upward and tied myself to the knife with my belt. When I awoke, indeed, the sea was calm, but I was adrift further from the coast than before. I was surrounded by bits of floating wreckage, but the ship herself was gone and so were my shipmates. The sky shone brightly as apparently an acceptable resolution had been reached by the adversaries. I pulled out my knife and started to carve my way through a barrel plank, enough so that I was able to crack the wood and snap pieces free. I reached inside and scooped the whisky with my palm. As I did, I heard a voice calling across the waves. It was my good friend Joseph. My other mate, Shawn, he was clinging there, too. I filled my lungs and called back, “I’m here, brothers! And I’ve got The Balvenie 14! She’s the Caribbean Cask!” At the news, they both kicked free from the barrel and began swimming. Once they arrived, they both reached in and scooped a bit. “Oh, that smells sweet,” Joseph exclaimed. We all sipped together and decided that the palate was that of fruit that had been sprinkled with something sweet, perhaps vanilla or brown sugar, and then warmed slightly in milk. And the finish, well that was enigmatic and took us a little longer. In the end, we noted it to be lengthy with a hint of spice. We drifted together for days. We never even noticed the rising and setting sun, and we always came to the same conclusions: We were being well cared for by a good whisky. Eventually we were picked up by another whisky vessel charged by His Majesty’s Navy to search for survivors. We were hoisted aboard and given fresh quarters. Our bellies were filled with beef and bread, and we were tended to by a fine clergyman. All was well. But that evening, whilst dining in comfort, the three shipwrecked survivors quietly reached a new conclusion. As the last of the seamen took his rest and the only waking eye was that of the night watch in the crow’s nest, we crept through the galley and joined one another in the cargo hold where Joseph had discovered another barrel of The Balvenie Caribbean Cask 14 year old edition. We prepped it accordingly, carried it up and out into the clear evening sea air, rolled it over the edge and jumped in after. Well done. I’ll remember this if I fall off the dock next week. I shall try it with me creme Brulee, me hearty. Thanks for stopping by! Be sure to read the other reviews. Hopefully they can be of interest as well. I will most definitely check out your other stuff. I enjoyed reading this one immensely! Talk about unique. Mixing pleasure with pleasure calls for a cautious approach. Nevertheless, I can taste it already. Be careful on that dock, my friend. We just returned from a month’s journey “up north,” and the Caribbean Cask proved to be a wonderful companion … when not working on a stash of red wines. I’m ready, pencil in hand. OK … another pre-north woods shopping trip with this list in hand. We’ll see how my budget handles the purchase of another trip companion. We are heading from drought country to a place where the lake is still too high due to too much water. And I’m sure the mosquitoes are milling about the driveway wondering when we’re coming back. The Glengoyne 17 or 21…or any of the Balvenie’s. I’ll expect to hear stories upon your return as to how much the mosquitoes enjoyed and toasted drams of your plasma in your honor because you were drinking the right stuff to their benefit. Enjoy your time away, my friend. For some unexplained reason I went off on a frolic of my own and came home with Glenlivet Nadurra. But the list is being retained for future venturing forth. Great choice. You will love it. Most amusing! Must agree – the Caribbean cask is a mighty fine whisky! Aye! It be a fine dram for a weathered soul.